As standard practice, from first contact we treat all projects as confidential and no client or project information is discussed or shared with a third party unless permission has been given. 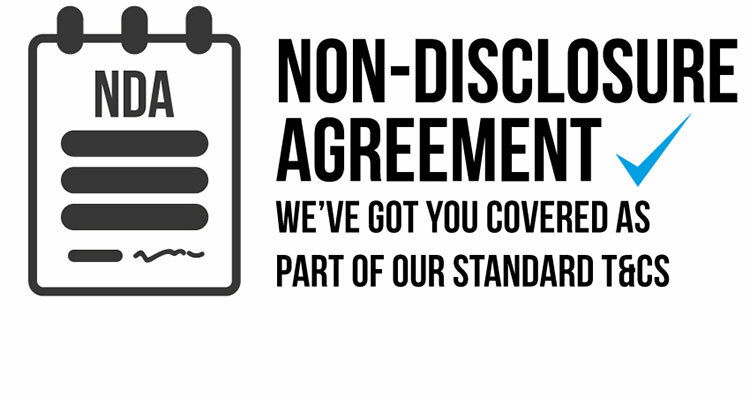 3DPRINTUK is willing to sign any additional non-disclosure agreement that you may require to start a project with us. For more information please read our full Terms & Conditions. The Client represents and warrants to 3DPRINTUK that any elements of text, graphics, images, designs, trademarks or other material supplied or disclosed to 3DPRINTUK are the property of the Client or the Client has permission from the rightful owner to use each of those elements and that 3DPRINTUK its use of such material shall not infringe the intellectual property rights of any third party. 3DPRINTUK will inform the relevant governing bodies in the event that it finds itself in possession of an illegal image. Any product produced by 3DPRINTUK for the Client using or containing anything supplied or disclosed by the Client which infringes the intellectual property rights of any third party will remain the liability of the Client and the Client will indemnify and keep indemnified 3DPRINTUK against any loss, damage claim or expense arising out of such infringement. Where all sums owed to us under this agreement have been received, 3DPRINTUK will assign to the Client all intellectual property rights (including copyright) in the final product as are owned by us and capable of assignment. All images, text, layouts, website scripts and source code appearing on or associated with our websites are copyright of 3DPRINTUK 2013. All media published on our websites remain the intellectual property of 3DPRINTUK. 3DPRINTUK shall have the right to use the Client’s name & logo royalty-free in its own marketing material. For more information please see out full Terms & Conditions. If you have any further questions please feel free to give us a call.